Classic truck...Can anyone identify??? Photo Picture Classic Cars for sale & Classifieds - Buy Sell Classic Car & Classic Truck Classifieds. 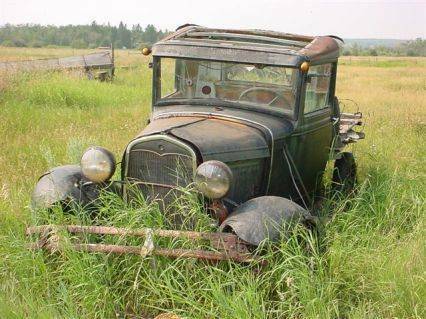 Car Photos > Rusty and Abandoned Classic Trucks > Classic truck...Can anyone identify??? Its a 1930 or 1931.The second two years of A model Ford cars/trucks have the nice line from the door to the hood like this one.The first two years look more like a model T at this spot with a thin line that does not mate up nice like these with the nice door/cowl line.The grill changed some to but they can be changed so easy you can not all ways go by that.The first two years in A model pick up trucks are taller and more squared.Like both but these better. Its a A Ford.They made them four uears 1928-1931.See the gas tank in front of the windshield?1932 I like better.They put the gas tank in back and grill shield is new.Lots of model A cars and trucks still around.Lots of street rods run 32 grills on them because they fit easy.A model had a down draft carb.32was first v-eight for ford and fuel pump for the tank at the back now.They still made the four allso for a few years.